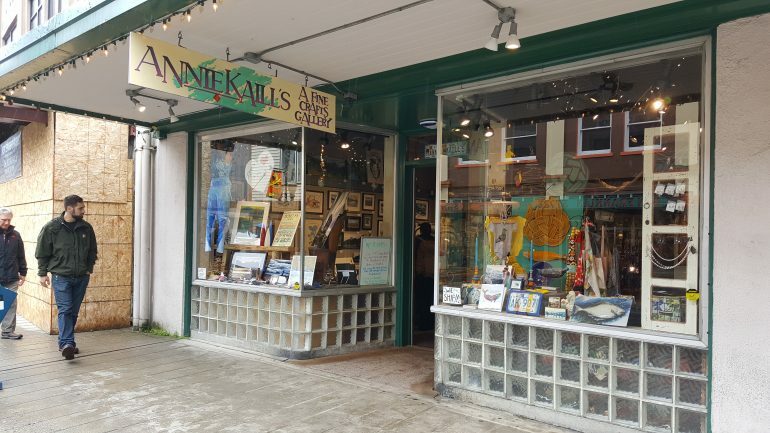 Annie Kaill’s is a fine arts gallery offering distinctive handmade craft items both from the local area as well as from further locations. Shoppers can find jewelry, cloth items, native and local artwork, and artisan pottery pieces. You can find the gallery downtown Juneau at 244 Front Street. You can see the website here: http://www.anniekaills.com/. Upon entering the store, the friendly staff will greet you and offer any assistance. They are happy to go into details on the history of specific items, even when one is quietly trying to decide which piece to purchase. The store features items from Annie Kaill’s Signature pottery line hand-painted with Alaskan wildlife. It also features pottery crafted by Pennsylvania native Bill Campbell. Even though it is not native, the colors still evoke an imagination of Alaskan nights and ice. 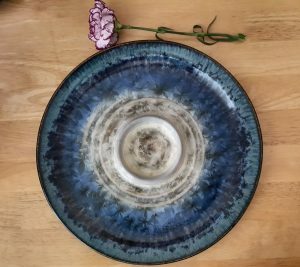 I purchased a Flambeaux line bread and oil plate colored in cobalt blue with frost-like crystals liberally covering the dish throughout. 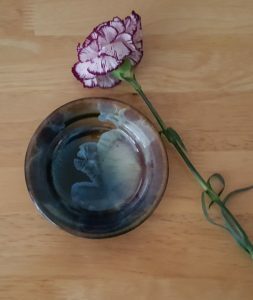 I purchased a small bowl with similar colors for use with dipping sauces. The colors evoked an imagination of icy glaciers at night, northern lights. For me it brought a happy memory of the flowery fireworks shot over the Gastineau Channel at the July 4 celebration the night before. Once a piece is selected, the friendly and helpful staff will wrap it up either for shipping or for carrying in your luggage. Even though it took me four visits to finally settle on a piece for purchase I loved the selection. 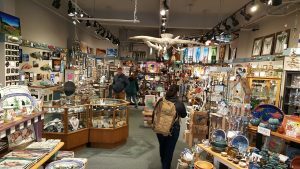 Although the items are a bit pricey, I recommend Annie Kaill’s as an ideal place to purchase upscale craft items and gifts.